However, the ISC campaign doesn’t turn the 14th Nobel Peace Prize Laureates’ Summit to the protesters’ favour and the campaign appears to be less successful than the ISC campaigning in the US. This year in the US the Western Shugden campaigners got at least some of their messages and accusations (slander) reported by local news and also some few major news. The lead in the press in Italy was set by a major newspaper, La Repubblica, with an interview by Raimondo Bultrini – a well known expert on the Shugden issue, an investigative journalist with a high standing and a mafia expert who is also a Buddhist and close student of Namkhai Norbu Rinpoche. Namkhai Norbu is a well known Buddhist master from the Nyingma school of Tibetan Buddhism and he worked at an university in Italy as a professor. Unlike past noisy protests this time the protesters had to perform their protests rather far away from the location. The Tibetan National Congress had campaigned for this end. Most of the Italian newspapers followed the lead by La Repubblica. This is a common media phenomenon, how and what one of the greatest newspaper of a country reports first sets the record for the other media in that country. According to a friend, the Italian newspapers took over most of the content of Raimondo Bultrini’s La Repubblica interview, and the position of the protesters is rather downplayed if not even ridiculed by the media. Some of the outrages commenters in Italy argued that the H.H. the Pope Francis seems to be more happy to visit mosques in Turkey than to welcome a Nobel Peace Prize Laureate but this seems to be quite unfair to me because Pope Francis’ faithful Christian brothers and sisters in China and their welfare might be more important to him … though it doesn’t feel very brave or solidly. I feel reluctant to condemn the pope’s decision. However, the appeasement politics to China by almost all Western countries, the giving in of Westerners to China’s bullying tactics indicate also a lack of integrity. Human Rights are talked about a lot but when the economics come in Human Rights are easily set aside. The Buddhist leader is in Rome, but he will not meet the Pope: “Religion is not enough, we need a secular ethics”. This is what the Dalai Lama says in this interview to La Repubblica, just ahead of the summit of Nobel Peace Prize holders that will take place in Rome from tomorrow [Friday] until Sunday. 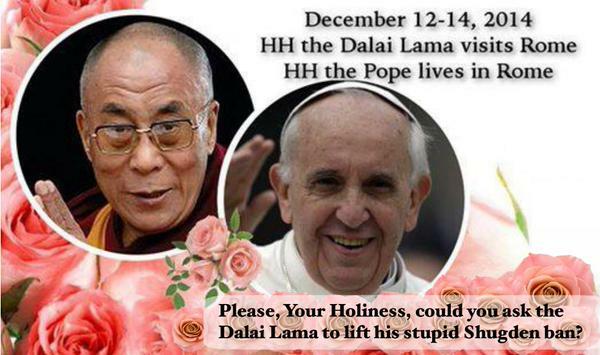 But a summit between the pontiff and the Buddhist spiritual leader will not take place. “An audience is not scheduled. There will be a message from the Pope to the Dalai Lama, signed by the State Secretary Parolin.” is what is communicated by the Vatican. The other topics discussed in this interview are the difficult relations with China, the Nobel Prize to Malala and the right to education, and the controversy of the “dissident Tibetan Buddhists”, who have also announced protests against the Dalai Lama in the coming days in Rome. But he also adds that religion alone is not enough to solve the troubles and the injustice in the world: “We need a secular ethics, which is shared also with non-believers”. Your Holiness, following Chinese pressure the Nobel Peace Prize holders have moved their world summit meeting dedicated to Mandela after you had been denied the visa to enter South Africa. What was your reaction? “You see, at the beginning, two Nobel Prize holders from South Africa had invited me and of course I accepted. However, the embassy in India refused to issue a visa for me. Even previously I wasn’t allowed to meet and pay my respects to Mandela before he died, but I accept things as they are. Of course, for the involved governments, national interests are important, but I can reassure them that the Dalai Lama is not a harmful person. My interest is in promoting human values, in a world of 7 billion members of the same family. Many people cannot understand why powerful China is so afraid of you. “They call me a demon and a separatist, but in reality it is the Chinese army that acts like a separatist in Tibet. If you hit a dog, it will run away. If you want the dog to stay, you have to treat it with kindness. Malala, who received the Nobel Prize yesterday, became a symbol for the right to education. Do you believe that education can be a substitute for religion? “Many people that create problems in many parts of the world are often well educated, so we must not talk only about education, but also about values. And it is religion that takes care of this. But today we must also pay as much attention to the secular ethics that is the foundation of all religious traditions. If education is combined with a spirit of kindness, then your education, your knowledge will be constructive throughout all your life. You will be able to contribute to society and to the improvement of humanity. You said you are eager to meet Pope Francis. There seem to be similarities in the simplicity of your approach to the world. You have said repeatedly that you might be the last of the Dalai Lama lineage, but the Chinese authorities have replied: “Whether he likes it or not, he must be reborn”. But China has already recognized and taken control of another “reincarnated” Tibetan. A group of dissidents that used to belong to your same religious tradition has been protesting for some time in various parts of the world and they will also be in Rome today. They ask for the freedom to worship a being that you consider a “sinister spirit” and they say they feel discriminated against. “Out of ignorance, from 1951 until 1970, I also worshipped this ghost. Then I found out that the 5th Dalai Lama, who had a profound knowledge of this matter, referred to this spirit as an entity born of distorted prayers and as harmful to the Buddha’s teachings. Making a mistake out of ignorance is understandable, but to consciously act mistakenly is another matter. Those people that manifest against me in public, in the USA and in Europe call me an enemy of Buddhism; they shout, beat drums and carry banners. Their faces are contorted in aggressive expressions. Their slogan is “Stop lying”: but who is lying really? I thank Robert Barnett for making a very clear analysis of many of the issues surrounding the protests against His Holiness the Dalai Lama, particularly in analysing the role of His Holiness in the wider context and the complex contradictions in the claims made by the protesters. I think it’s important to clarify further what the distinctions are between Western and Tibetan practices of Shugden and how this ‘disaster’ is defined. Western Shugden followers engaging in the demonstrations are overwhelmingly the students of Kelsang Gyatso of the New Kadampa Tradition. Here the ambiguity arises. The NKT state that ‘Je Tsongkhapa’s lineage’ will be destroyed without Shugden practice. As the NKT do not study any of Je Tsongkhapa’s works their claim is at best unfounded – what they fear is the ‘denigration’ of their own tradition, based on Kelsang Gyatso’s Shugden as a core practice. Tibetan Buddhist practitioners do not have Shugden as their central practice but as one amongst many. I would say that it could be possible that the ‘label’ placed on Shugden could have been deliberately ‘exaggerated’ – from being a protector to being a Buddha – precisely so that Western followers of Kelsang Gyatso will engage with Shugden as a ‘Human Rights’ issue, and as their practice – created by Kelsang Gyatso – is highly edited from Tibetan versions, the Dalai Lama’s decision then appears incomprehensible and worthy of contempt. Also, within Vajrayana practice it is considered essential to avoid interacting with those who disparage your spiritual teacher. Therefore many Tibetans will not trade with Shugden practitioners. The shop keepers gain nothing as they lose trade. In the Indian context this is perfectly appropriate behaviour and certainly not illegal. We should be careful not to think that we can superimpose a ‘definitive’ ‘Human Rights’ perspective on this. I have been told that no Shugden practitioner has presented themselves for election so far. If this is the case, how can prejudice be the cause of non-election? The premise becomes absurd. If no one is elected once they have stood for election, then is this necessarily caused by prejudice? But this question is also out of place as long as no one stands to be elected. That it is a lack of knowledge or direct interaction with Shugden practitioners that leads to the idea that cooperation and interaction with them is the only possible political solution. Precisely because it was not possible over a long period of time, the division of monastic property was peacefully executed and, since then, has been a viable solution to the conflicts in India. The area of conflict has, instead, shifted to areas where Tibetan monastic institutions have no control but also, ironically, where there is complete freedom of religion and no limitations whatsoever on Shugden practice. It is this contradiction – why Westerners and Westernised Tibetans should be demonstrating ‘for’ people who have been without conflict for the last few years – that astonishes most Tibetans who see the NKT’s demonstrations (as well as the exaggerated and irrelevant claims against His Holiness that Robert Barnett clearly describes). Only the Chinese connection which has a need to provoke Tibetan disunity can justify demonstrations in the West. In fact, the timing of the 2008 demonstrations against His Holiness with the extreme repression in Tibet could be seen as deliberately provocative, deflecting the media focus around His Holiness towards Shugden instead of Tibet. Or is it an internal issue within the NKT that has caused them to restart the demonstrations as no change has occurred in exile Tibetan policy or practice since 2008…? Why stop demonstrating for 6 years if their campaign is so valid and important? why do you find it necessary to “moderate” comments? I find it necessary to “moderate” comments because anything related with Shugden gets out of control so that forums such as dharmawheel, e-sangha, new kadampa survivors blocked any discussion and links completely. By approving the comments I can at least to an extent contribute towards a saver discussion. Problem is that sometimes I have not the time to read all the comments. In brief I think the moderation contributes to a better atmosphere. Tenpel has often allowed a number of dissenting posts through. This is not the case on cult venues, nothing is ever allowed to disturb their echo chambers.